This quinoa salad with avocado, cherry tomatoes and feta is a healthy salad – perfect for anytime of the year. It’s light, flavorful and filling. This salad is made with quinoa, which is full of protein and fiber and has a subtle nutty flavor. Next, add creamy avocado, sweet cherry tomatoes, salty feta and crunchy walnuts. Everything is tossed with fresh baby spinach and a zesty white wine vinaigrette. An easy, tasty salad that’s perfect for lunch or dinner. One of the things I’m trying to do is keep cooked quinoa on hand in the fridge. Having a large bowl of cooked quinoa in the fridge makes it easy to add a healthy whole grain to your salad. Technically quinoa is a seed but I think most people think of it as a grain – at least I know I do. 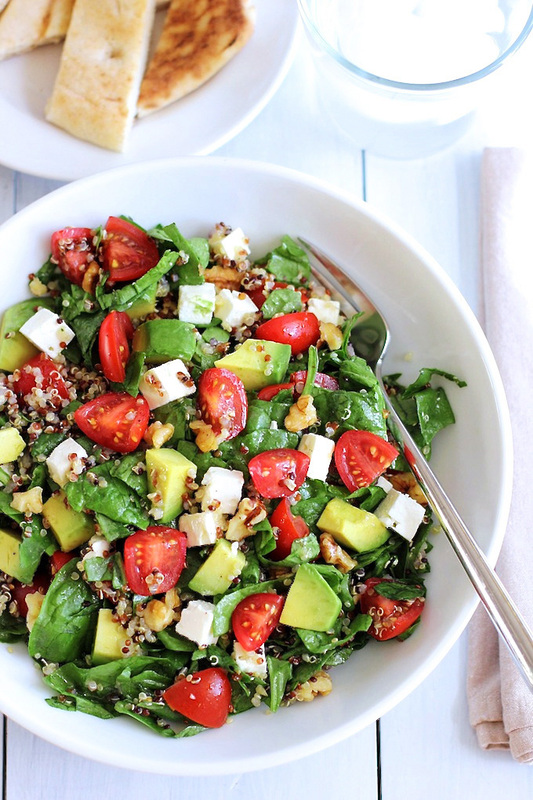 Having quinoa precooked means you can whip this salad up in no time at all. I’m happy to eat a salad everyday and this quinoa salad with avocado, cherry tomatoes and feta is one of my new favorites. So if you’re looking for a colorful, healthy salad why not give this one a try. This quinoa salad with avocado, cherry tomatoes and feta is a healthy, fresh salad that is light, flavorful and filling. Dice avocado into a medium dice and add to the bowl. Slice cherry tomatoes into half or quarters (depending on size) and add to the bowl. Dice feta cheese and add to the bowl. Mince red onion and add to the bowl. Add cooked quinoa and walnuts to the bowl. Whisk olive oil, white wine vinegar, honey, dijon mustard, black pepper and salt together. 1. Make sure to rinse your quinoa before you cook it. 2. After cooking the quinoa, drain off any left over liquid using a fine mesh sieve. 2. The easiest way to cool your quinoa quickly is to spread it out onto a baking sheet. 3. Give your spinach a rough chop, this make it much easier to eat. My husband asked for SECONDS! It was delicious, even w/o the walnuts or onion. Haha – asking for seconds is huge for a husband and salad! Thanks for letting me know, Joy! We made this but added celery and omitted the Feta – only because I didn’t have any. This recipe is so flexible and yummy. We loved it. Thanks for letting me know, Stacia – glad you liked it so much! I will be making this again! I eyeballed the salad ingredients and used a lot more quinoa to make it a more filling meal. Glad you enjoyed it. Thanks so much for letting me know, Jenny! Not a leaf was left!!! I received only compliments about it. Thanks so great, Giovanna! Thanks so much for letting me know. Have a great holiday! Loved this recipe, the dressing is perfect. I’m not allowed to eat raw spinach due to thyroid problems but regular mixed greens came alive and shined in the mix just fine. So lovely, especially the tiny hint of minced red onions. Used Trader Joe’s tri-color quinoa and it was perfect. Thank you for the wonderful meal! Thanks so much for letting me know, Angel – glad you enjoyed it! Hi Netta – Kale will definitely change the taste – but it should still be good. I would definitely slice the kale very thinly and then toss the dressing over the kale and massage the kale to soften it before adding the other ingredients. Let the kale and the dressing sit while you make the quinoa – that should help soften it up as well. Hope it works out well for you. Goodness – I love everything about this salad! The bite of the feta with the crunch of the walnuts is a thing of beauty! So bright and fresh! YUM! Thanks, Annie! You’re right – there’s a lot of texture and taste going on in this salad! I will most certainly try this recipe with cauliflower (riced)!! Thanks, Gigi! I have yet to try cauliflower rice – but it would probably make a great addition to this salad. Hi Kait – thanks so much for stopping by and leaving such a nice comment – I appreciate it! Just checked out your blog and saw your lovely wedding photos – happy anniversary! This is THE perfect salad for summer! Healthy, light and FULL of delicious flavor! I try to always keep cooked quinoa in the fridge too, because you are so right- it is perfect to add to so many things! I have some in the fridge now, and I KNOW what I will be making with it next! This scrumptiousness! Cheers and thanks for sharing the YUM! Thanks for the kind words, Cheyanne! Hope you try it and enjoy it! 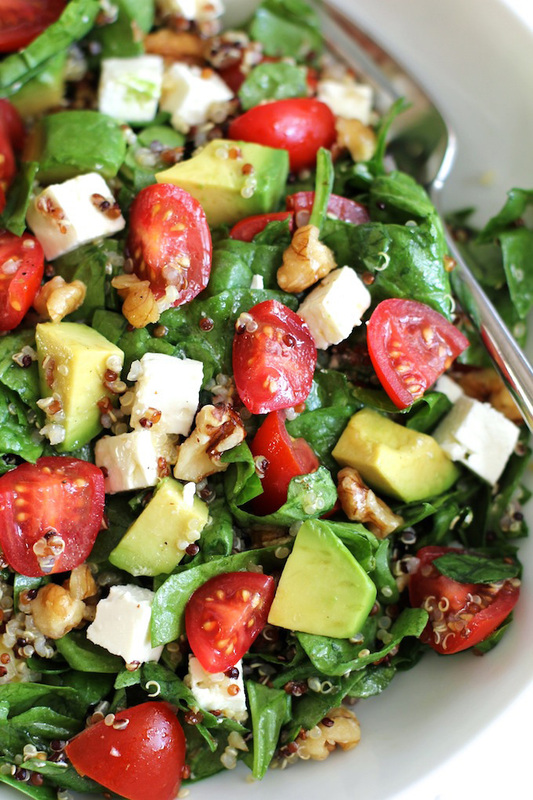 Best salad yet….. And have a big bowl of quinoa in the fridge. Thanks, Mom – knew you’d like this one! I love this light refreshing summery salad! Mmm! I would love to have a big bowl of this for lunch tomorrow. tHis salad pretty much makes every other boring lettuce salad seem so basic 😉 Thanks for sharing! Pinned! Thanks, Izzy. I do that all the time – have something in mind for dinner and then realize that I don’t have it in the house! Thanks, Kennedy. Hope you try it! This salad looks beautiful! 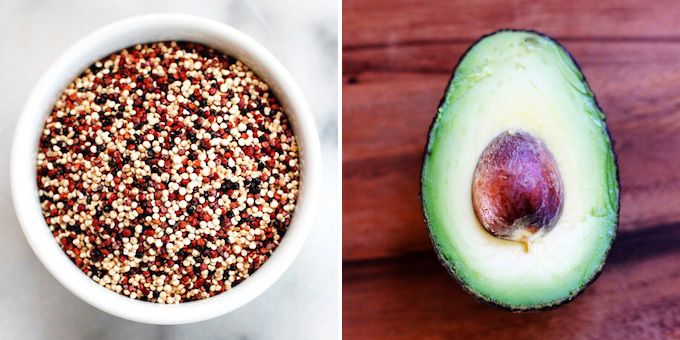 Love the quinoa and avo in it! Thanks, Kathy – quinoa and avocado work really well together – let me know if you try it! This is one perfect summer salad, Geraldine! 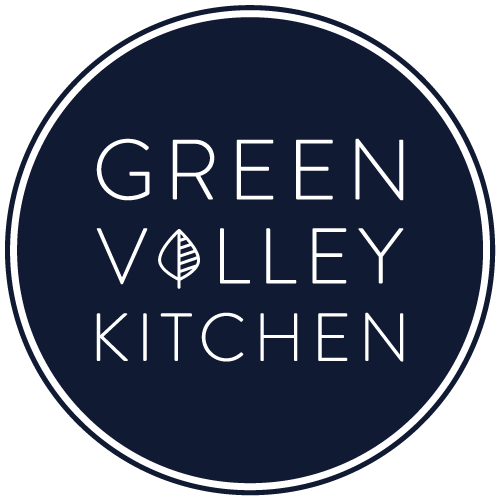 Love your idea to cook quinoa in one big batch every week. I’ve often thought of doing that, but never seem to get around to it. Now I have this salad as inspiration! And gorgeous photos, by the way! Hey Julia – definitely try keeping some cooked quinoa in the fridge – it makes it super easy to whip up a salad – especially if you’re bringing lunch to work and you’re in a rush in the morning (like I usually am). Thanks so much, Denise! Your salads are pretty awesome, too! It’s face plant time… right into my computer screen! Your photography is lookin good my dear! Are those tomatoes from your garden? This is just gorgeous, Geraldine and so nourishing. Love your tip regarding quinoa in the fridge. What a fabulous, yet simple idea. Tomatoes are just comin in up here and I can’t get enough! Thank you for this, Geraldine. Hey Traci! My tomatoes are coming in fast and furious – but I didn’t use them in this recipe. I’m growing black cherry tomatoes this year but they don’t photograph very well since they are a dark brown color – but they are really delicious – I think they are my favorite cherry tomato yet. Thanks for the photography compliments! This combines pretty much all of my favorite salad ingredients! I love that you added walnuts. I’ve been trying to keep pre-cooked quinoa in the fridge lately too, but (in an unexpected twist) my boyfriend keeps eating it all! Ha – your boyfriend has good taste I see. Thanks, CakePants!